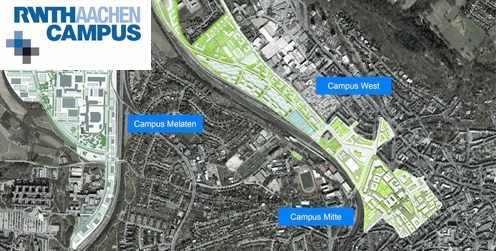 The Smart Logistics Cluster is one of the thematic clusters on the campus of the RWTH [Rhineland-Westphalian Technical University] in Aachen. RWTH Aachen intends to use the campus project as a vehicle to develop itself into one of the global leaders among technical universities. This goal is creating an unparalleled service range for cooperation in specialised clusters, in which RWTH is supplying know-how and an unrivalled research infrastructure. The university’s Research Institute for Rationalisation (FIR) is intensively involved in developing the Smart Logistics Cluster on the RWTH Aachen campus. More than 120 companies are already engaged in the campus project. German and international companies are receiving the opportunity to contribute their own research and development resources on the campus. They share resources with university institutes, utilise synergy effects and exchange knowledge on the spot. Industrial partners also obtain access to qualified junior personnel as well as special basic and advanced training.